DENMARK – It’s hard to believe looking back on a 23-5 Denmark team that came within a couple of wins of a Golden Basketball that these Vikings were treated with such disregard before the season opened. Yeah, that’s right. Denmark was picked to finish somewhere in the middle of the pack in the North Eastern Conference. That, despite returning a North Eastern Conference first-teamer, second-teamer and honorable mention, their top three scorers and rebounders, their top defender … and five seniors, two of whom already had three years of meaningful varsity experience and two others with two. On the other hand, what they accomplished, while certainly not shocking, did take some of that nose-to-grindstone grit. After all, this team had only two notable scorers after Brady Jens got hurt early in the season and was never fully himself thereafter. The Vikings often played only six players, while their seventh, freshman Donovan Short, saw sparse action if he saw the floor at all, though he made some valuable contributions at key moments. 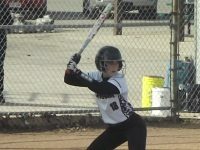 Head coach Cody Stelmach was able to make those limited parts cohere, transforming the Vikings from an offensive-minded team to begin the season to a much more patient, defensive-oriented team by the end. It paid off in a big way. A share of the conference championship. A regional title. A sectional crown. A special team. A special season. Grand Opening: Denmark unveiled its new season and brand-new arena in high style on Nov. 24, pasting Valders behind Patrick Suemnick’s eye-popping 22 rebounds and 29 points. 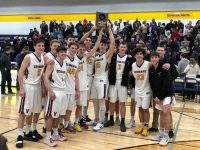 Denmark Runs on Dunkin’: The Vikings picked up a huge road win at Little Chute, which might have had to replace its rims afterward. Pat Suemnick had 29 points, 13 rebounds, five blocks … and six dunks. Zach Attack: Zachary Gezella launched eight threes at Luxemburg-Casco on Dec. 18. Seven went through, good for 25 points, helping Denmark rally from 14 down for an 84-74 victory on the road. Coming Up Short: Over a remarkable three-game stretch in January, Zane Short scored 106 points (35 at Marinette; 36 vs. Wrightstown; 35 vs. Waupaca). He also became the sixth Viking boy to reach 1,000 points, achieving the milestone in an overtime loss to Wrightstown. His 35 and 13 at Marinette gave the Vikings their third straight tough road win. 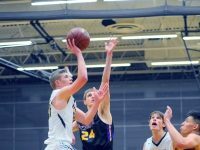 St. Valentine’s Day Massacre … Averted: Denmark could afford no losses down the stretch if it were to have any hope of a conference championship but found itself down 13 to Marinette at halftime on Feb. 14. Behind sophomore Brennen Miller’s 14 points, the Vikings rallied to keep their title hopes alive. A Lot To Celebrate: First things first. On Feb. 16, Brady Jens became the seventh player in program history to reach 1,000 points, doing so with a clutch free throw in the second half. Oh, Denmark beat Freedom, by the way, 65-52, avenging an earlier loss to the Irish, which came in the first game Jens missed due to an ankle injury. Scoreboard Watching: In the final game of the regular season, the Vikings needed Freedom to upend Wrightstown to have a chance at sharing the league crown. What they seemed to forget was that they also needed to take care of business at Waupaca. The Comets didn’t seem to care a whit about Denmark’s wishes and led by 12 in the first half. Bottom line: Denmark rallied for a win behind Zane Short’s 33 and Freedom beat Wrightstown. The coaches alerted the players immediately after their win that they were co-champions for the team’s second victory celebration of the night. 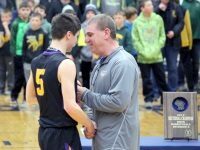 Returning the Favor: Last year, Sheboygan Falls ended Denmark’s season in the second round of regionals. This year, Denmark beat the Falcons, 63-57, to avenge that loss and, more importantly, win a regional championship. 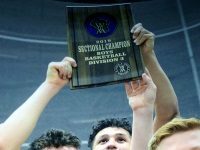 It’s Not Supposed To Be Easy: Maybe it was thinking about playing in the Kohl Center that got the Vikings’ minds off the game at hand, but Denmark nearly gave away a 14-point lead over the final six minutes of the sectional championship game on March 9. Freedom got it down to four, still with two minutes left, but Denmark found a way to hold on for a 46-41 win and a trip to Madison. 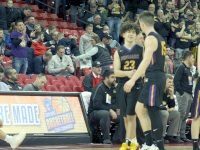 A Season To Remember: No, the Denmark Vikings didn’t win all those games just to get to the Kohl Center. They went there to win it all. That they fell in the semifinals on March 14 to a one-loss Waupun team with a Division 1 college player, though, hardly diminishes what the team accomplished and what the players got to experience playing in the home arena of the Wisconsin Badgers with all the attendant hoopla, bells and whistles. Nothing – absolutely nothing – can beat the exuberant smile of each Viking player as he watched his face on the Jumbotron and heard his name over the PA during pre-game introductions. A Thrilling Ride For All: From the players to the coaches to the parents to the students to the fans and, yes, to the media that had the privilege of covering it all, what great fun it was. Congratulations, boys. You made memories.